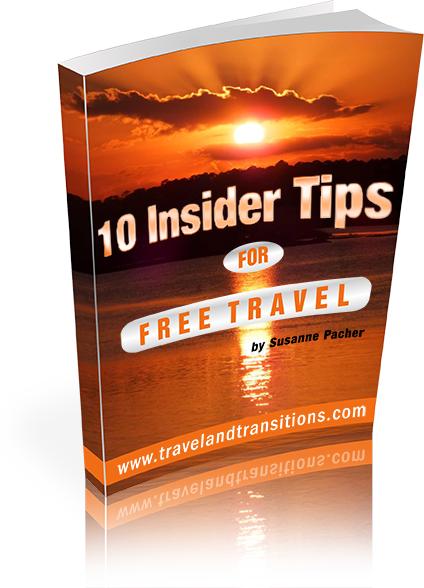 It was another gorgeous sunny day when local expert Luis Casareal and I embarked on an out-of-town excursion on March 5, 2014 from San Miguel de Allende into the Mexican heartland. 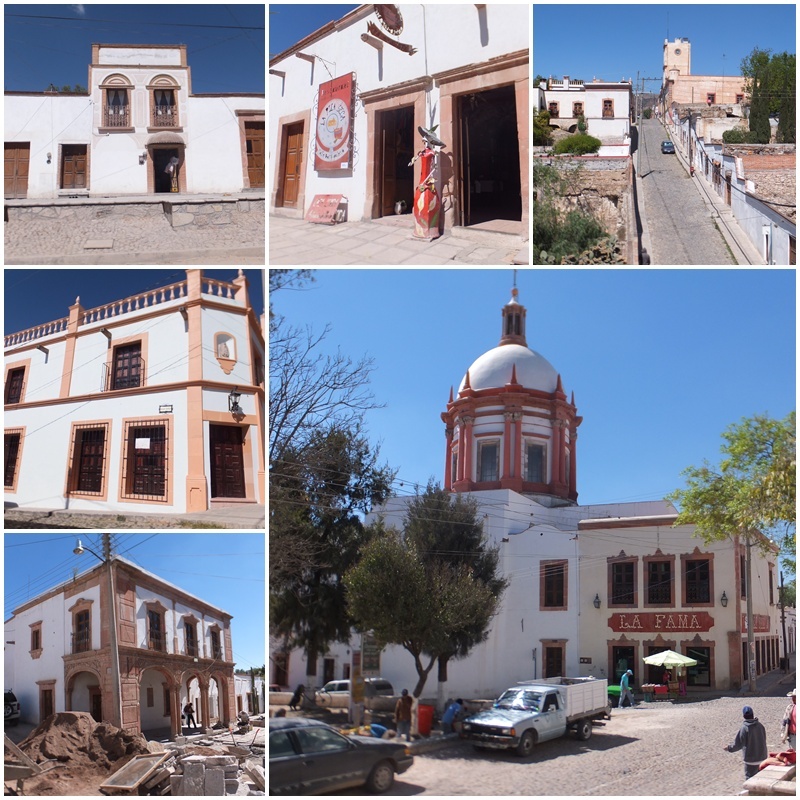 Our first destination was Mineral de Pozos, an old mining town that at one point had about 500 independently owned different mines, extracting valuable resources such as gold, silver, copper, and various other metals and semi-precious stones. After a huge mining boom around the turn of the last century, mining came to an end in the 1920s when the mines were flooded and the price of silver dropped precipitously. By the 1950s, only about 200 people were left in Mineral de Pozos while the old haciendas and the rest of town were abandoned for decades and even served as a backdrop for western movies. In 1982, the town was declared to be of national historic significance and in 2012, Mineral de Pozos has been designated the title “Pueblo Magico” (“magic village”) and the corresponding government incentive programs have led to a large-scale resurgence and renovation efforts in town that has attracted new tourism businesses. 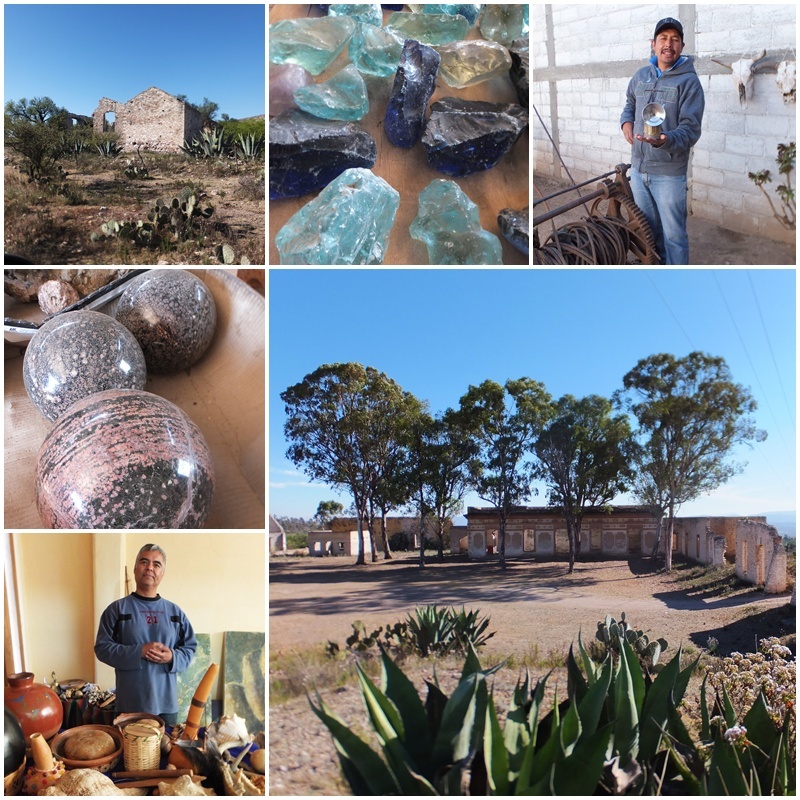 We visited a local vendor of precious stones who educated us about the historic mining process. Back near the centre of town we also stopped in at a local store that sells pre-Hispanic instruments made of stone, bone, seeds and other materials that are made using ancient indigenous techniques. Our third stop in Mexico’s Mineral de Pozos was the Posada de Las Minas. Originally built in the late 19th century, this elegant mansion has recently been completely renovated and is now the finest hotel in town. The Posada de las Minas has 6 uniquely decorated bedrooms and 2 apartments. The décor ranges from colourful Mexican folk art to elegant Victorian, even featuring an antique iron bed. The Luna de Miel (= honeymoon) suite we visited also features a beautiful private balcony with a magnificent view of Pozos and its parish church. 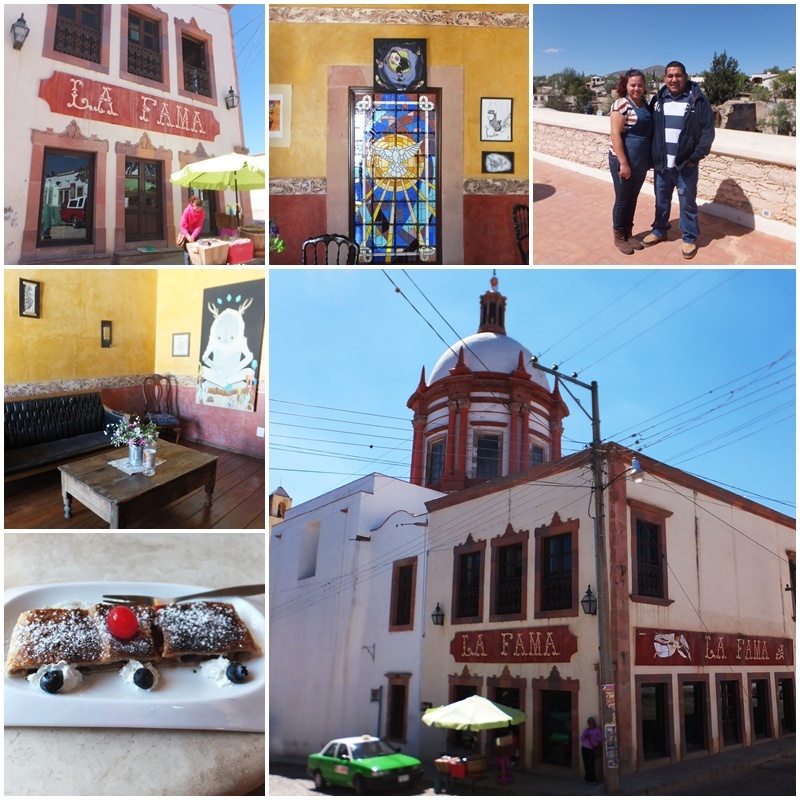 We continued our explorations of Mineral de Pozos and stopped on the main square at the Café La Fama. 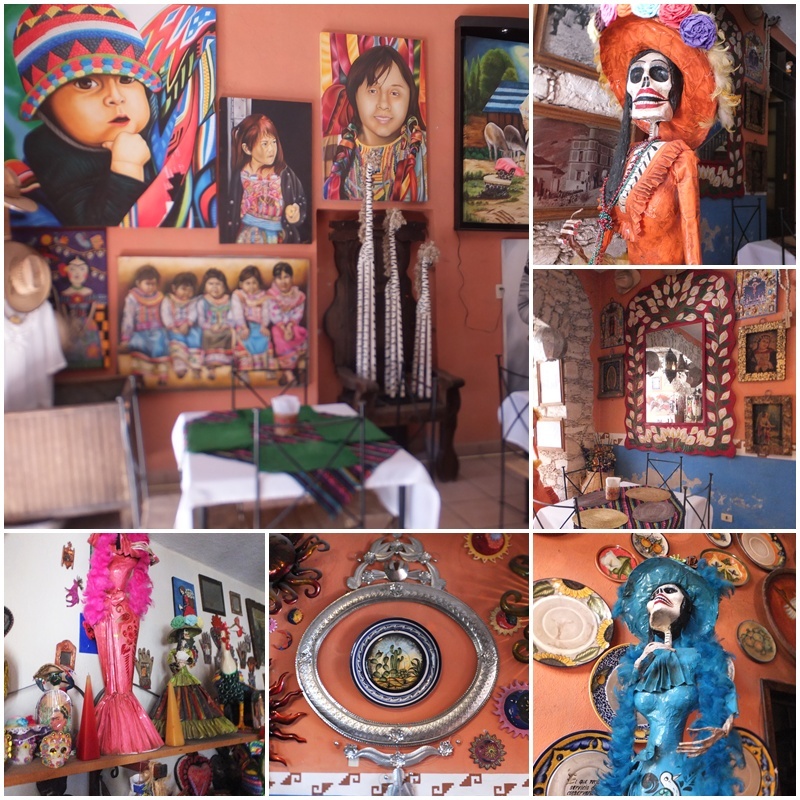 Local guide Luis Casareal knows all the neat spots in town, and this café with all its paintings and its gorgeous rooftop terrace with a view of all of downtown Pozos is definitely worth a visit. Paulina who works in the café, welcomed us graciously and showed us around, and we even sat down for a piece of Mexican apple strudel to taste some of the handcrafted sweets on offer. 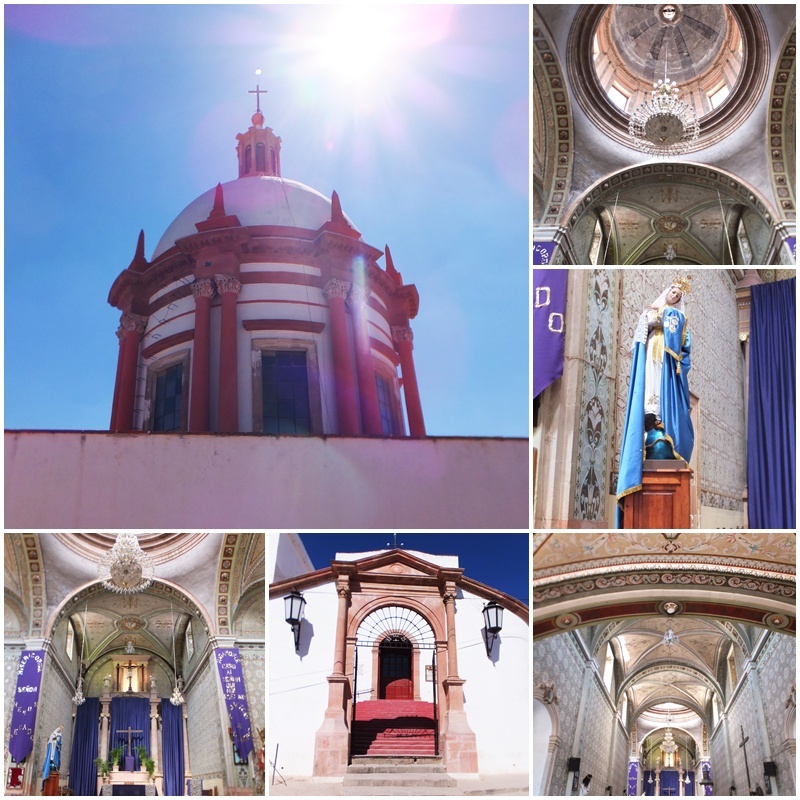 The Café de la Fama in Mineral de Pozos is attached to the 18th century Parroquia de San Pedro, which has a magnificent cupola and a rather austere interior with tiled walls and sculptures of various saints. The church overlooks the main square which is being completely reconstructed now that Mineral de Pozos is no longer a ghost town and is being re-inhabited. After mining came to an end, Mineral de Pozos was almost completely abandoned from the 1950s until about the 1990s when it started being repopulated by artists and artisans who are now anchoring tourism in Mineral de Pozos and have made it a popular weekend destination. On the main square of Mineral de Pozos is another interesting place, a restaurant called “La Pila Seca” which offers an authentic Mexican atmosphere. The place is adorned with countless local pieces of art and serves traditional Mexican cuisine, including Arracheras (flank steaks), Parrilladas (barbecue), seafood and “enchiladas Potosinas” (filled corn tortillas, San Luis Potosí style). Breakfast starts at about $3.50 per person. The owner also showed us the upstairs which is an antique store run by his mother. I was particularly fascinated with the “Calaveras Catrinas”, the elegantly dressed female skeletons with their big hats that are so popular in Mexico. Construction was underway on the main square of Mineral de Pozos, the formerly abandoned mining town that is quickly revitalizing and developing into a popular getaway destination about an hour outside of Mexico’s San Miguel de Allende. Mineral de Pozos is a “Pueblo Mágico” (“Magic Village”), a special designation from Mexico’s Secretariat of Tourism that is awarded to towns that offer a magical experience due to their cultural riches, natural beauty or historic relevance. Mineral de Pozos certainly falls into that category. 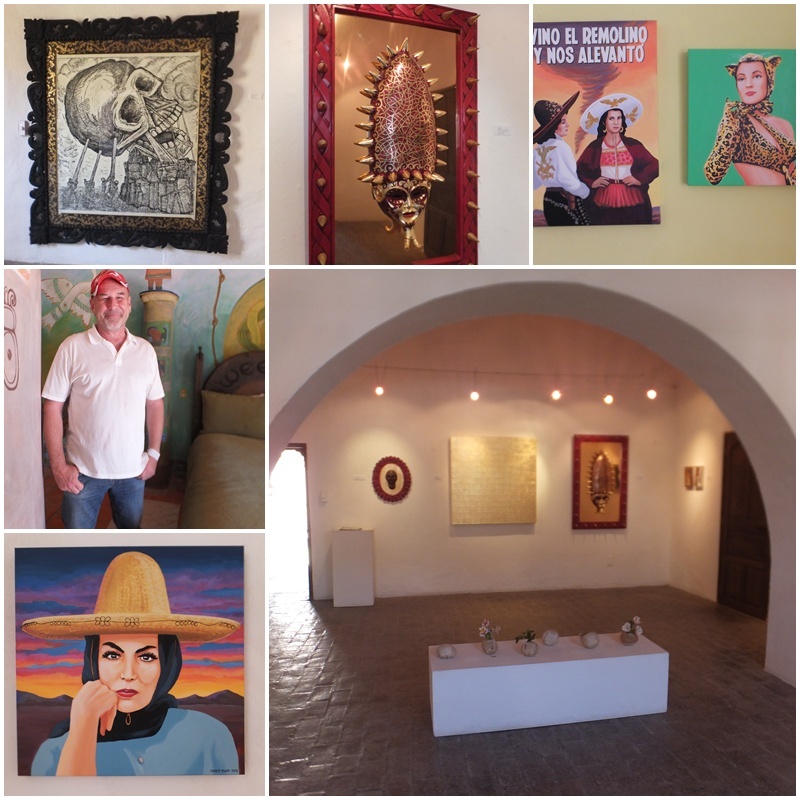 After a long period of abandonment that turned it into a ghost town, Mineral de Pozos was rediscovered in the 1990s when a number of artists settled down here and started the revitalization trend that is now pervasive all throughout town. 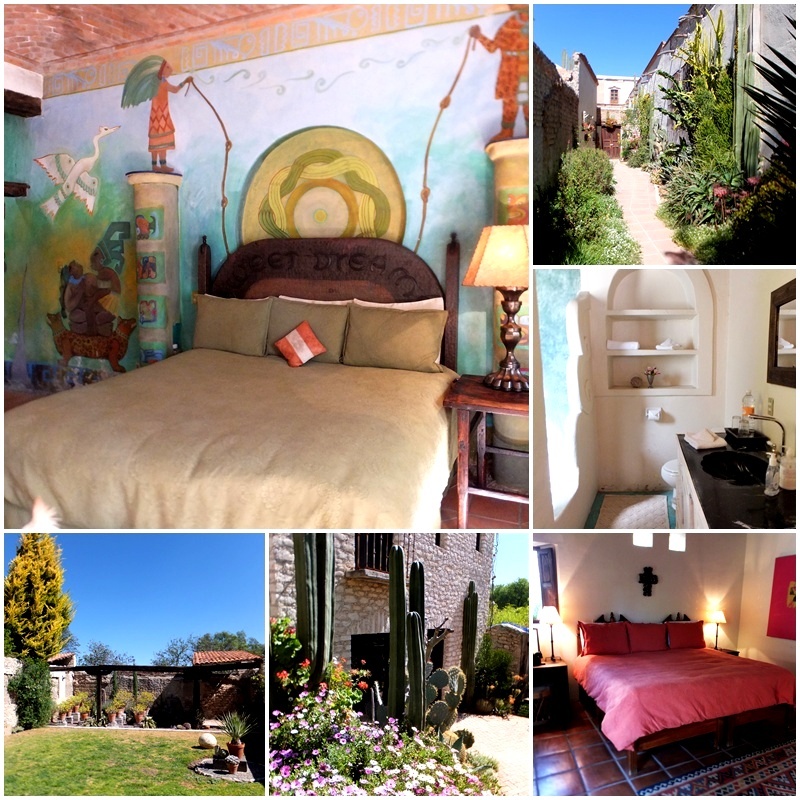 El Secreto Mexico, a bed and breakfast on the main square of Mineral de Pozos, is one of the places that has been brought back from a complete state of ruins to become one of the town’s most beautiful accommodation providers. Opened in 2010, it took about a year to renovate the building from top to bottom. Owner Nick Hamblen showed us around his artistic property that also has a full –fledged gallery with stunning artwork. 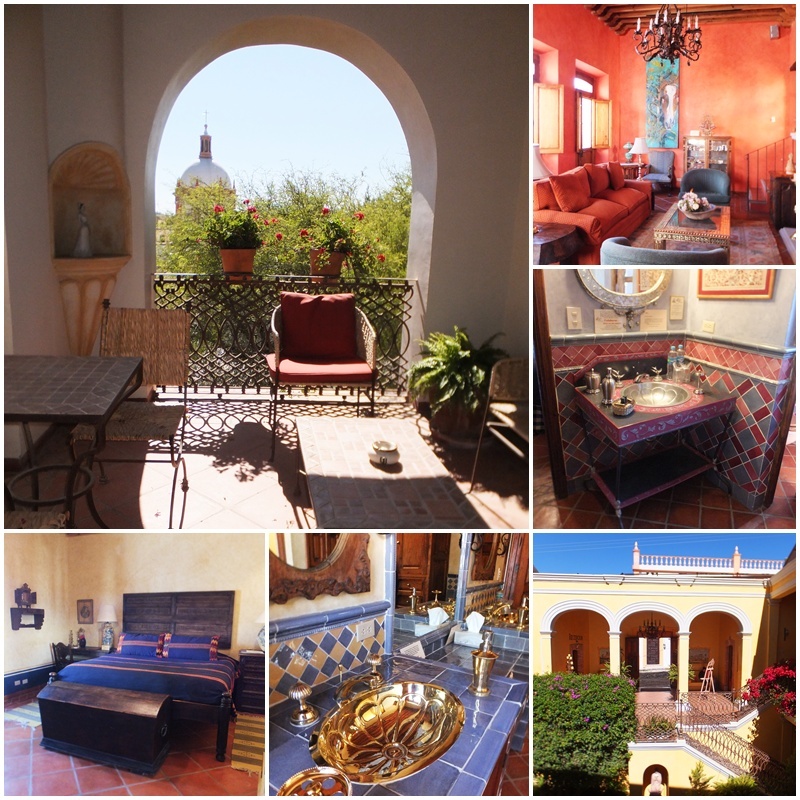 El Secreto Mexico is a lovingly restored bed and breakfast on the main square of Mineral de Pozos with three luxurious bedrooms and several courtyards. Guests can enjoy breakfast outdoors in the mornings, and one of the rooms features a stunning mural with pre-Hispanic subject matter and a cozy reading nook. All the rooms are equipped with wood-burning fireplaces and luxurious bedding while the bathrooms feature traditional Mexican tile work. A tunnel underneath a leafy hedge is used as a place to provide relaxing massages. El Secreto Mexico is the perfect place to get away and relax as well as to explore the fascinating history of Mineral de Pozos.